Dr. Smith's ECG Blog: Chest pain, ST elevation, and negative serial trops: normal variant ("early repol"). Right? 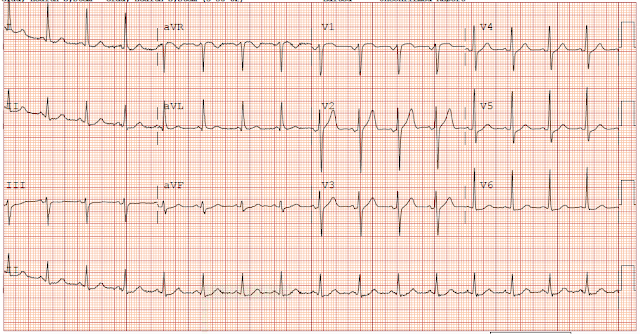 Chest pain, ST elevation, and negative serial trops: normal variant ("early repol"). Right? To me this is clearly an anterior STEMI, and it meets STEMI criteria even for someone under age 40 (at least 2.5 mm in V2 and V3, as measured at the J-point, relative to the PQ junction). On the other hand, normal variant ST Elevation (often called early repolarization) may also have very marked ST elevation. So when there is upward concavity in all of V5-V6, absence of any ST depression, and absence of Q-waves, it still might be early repol and the computer might not call this anterior STEMI. Even the most contemporary algorithms are very inaccurate (see references below). Formula value = 26.1. At greater than 23.4, this is diagnostic of LAD occlusion until proven otherwise. The computer did not diagnose STEMI. It did say "consider anterior injury." However, the physicians thought it was early repolarization and admitted the patient for rule out MI. Serial troponins were all undetectable (Beckman Coulter Access AccuTnI+3 Troponin I on DXL 600), LoD 0.010 ng/mL, 99% reference at 0.040 ng/mL), and thus the patient did rule out for MI. At some point, the symptoms resolved; it is unclear when. Notice that all ST elevation has resolved! The physicians were alarmed by this and realized they may have dodged a bullet. They took the patient to the cath lab and found an 80% thrombotic LAD lesion. It was stented. This patient (and his physicians) were very lucky. Had this patient not spontaneously reperfused, he would have lost his entire anterior wall, and possibly died. It is dangerous to rely only on troponins for the diagnosis of acute coronary syndrome! 2. Unstable Angina still exists!! Troponins may all be negative even with severe ACS. 4. Serial ECGs should be every 15 minutes, NOT every 12 hours! 5. High sensitivity troponins might have made a difference. But maybe not. 6. Often, the only way to diagnose acute MI is with serial changes in the ECG. In this case, resolution of ST elevation was diagnostic even in the absence of troponin elevation. 1. Mawri S, Michaels A, Gibbs J, et al. The Comparison of Physician to Computer Interpreted Electrocardiograms on ST-elevation Myocardial Infarction Door-to-balloon Times. Critical Pathways in Cardiology 2016;15:22-5. 2. Garvey JL, Zegre-Hemsey J, Gregg RE, Studnek JR. Electrocardiographic diagnosis of ST segment elevation myocardial infarction: An evaluation of three automated interpretation algorithms Journal of Electrocardiology 2016;49:728-32. How frequent is this phenomena of NEGATIVE SERIAL TROP with Unstable Angina or Impending big Anterior STEMI as observed in the index case ? Uncommon, but I've seen it many times. I have not found any papers on the topic. This was not only negative troponins, but UNDETECTABLE!! Its possible in presence of Troponin Antibodies....such patients present with heart failure as well .. You should have sent tropinin antibodies ......google search for troponin antibodies . May I add that in the ECG#1 the anterior T waves are alarmingly large ("fat"), as I have lerned repeteadly in this blog? Many thanks for presenting this case! Mario, of course. And that is why the QTc is longer than one would find in normal variant. It is the long QT that drives the formula to a high value. the alternative to diagnose ischemic injury could be the administration of nitrates and the observation of the response in the pz? Wonderful case by Dr. Smith! 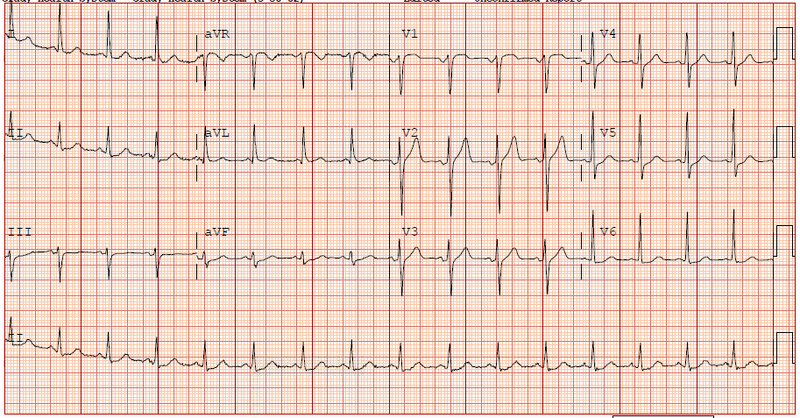 I’ll add the following comments: i) I would not be expecting “Early Repolarization” as the explanation for this ECG in a man who is 58 and presenting with active chest pain at the time of this tracing (ie, early repol must be a diagnosis of exclusion in a patient this age presenting with active chest pain … ); ii) Although concave-up ST elevation may be seen in various lead areas when due to “early repolarization” — it is NOT typical to see 3mm of J-point ST elevation in lead V1, but none in inferior or lateral leads; iii) Early repol does not typically present with the “shape” of ST-T wave that we see in all anterior leads (more than 3mm of J-point ST elevation with disproportionately tall, peaked T waves); and iii) if this was pure “early repolarization” — I would NOT expect to see the FLAT ST segment that we clearly see in lead V6 … LOTS to learn from this case — THANKS to Dr. Smith for presenting! The first ECG showed STEMI, which implied 100% occluded LAD. I wonder if it is possible that the thrombus could be spontaneously lysed from 100% to 80%? 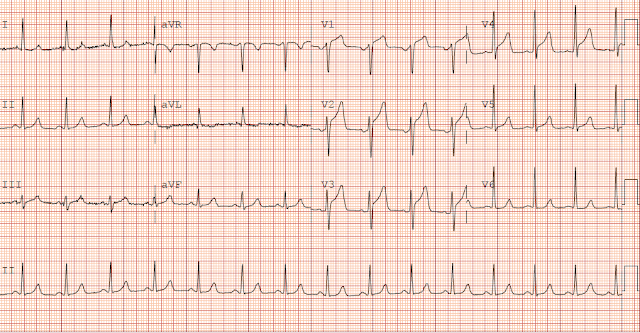 Or, it was the 80% occluded LAD that could manifest as ''ST elevation'' in lead V1 to V4? And, if it was LAD spontaneously lysed from 100% to 80%, why there was no reperfusion T waves like the mechanism of Wellen's syndrome? Thanks again for presenting this case! It spontaneously lysed from 100% to 80%, and did so fast enough that there was no myocardial necrosis (no elevated troponin). Wellens' waves only occur when there is some infarction, often very little. But with no troponin elevation, one does not expect Wellens' waves. Would cath lab accepts initial ecg as stemi? if not, would echo with anterior akinesia convince unterventionist? Every interventionalist is different! Echo would definitely be convincing. Good case. Nondetectible troponins define a subgroup with stable or relatively stable plaque and/or short CA spasm occuring spontaneously or inducible by activity, eating, anxiety, et. al. Patients with obstructive stable angina also have provocative ST elevation, positive NSTs, positive stress echos but usually without sufficient tournicut time for myocardial cell injury and enzyme release, ie, nondetectable or < 99% gender based cut-off troponins. The literature seems to support primarily medical management for this group. 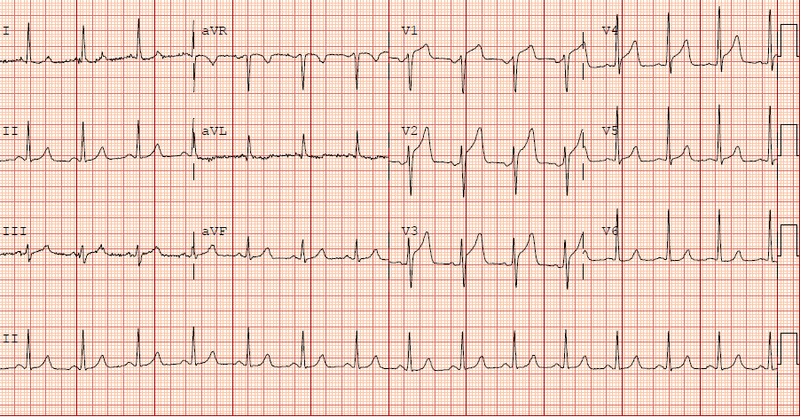 A new anginal pattern or rest angina relegates this patient into an unstable category. Medical management is not appropriate for ruptured plaque with thrombus, which is what was found here. A stent is necessary.